In stock -This product will ship today if ordered within the next 11 hours and 58 minutes. Quest Lactase Biotix contains a combination of lactase enzyme and lactobacilli bacteria to help make milk or dairy produce more readily digestible to your system. Lactobacilli bacteria creates lactic acid by helping to break down lactose and other other complex carbohydrates found in dairy products and other foods. Subsequently release these ingredients directly into the intestine. Providing 2 billion; L.rhamnosus and L.bulgaricus. Lactase, microcrystalline cellulose, lactobacilli culture, magnesium stearate, capsule shell (hypromellose, gelling agent: gellan gum). 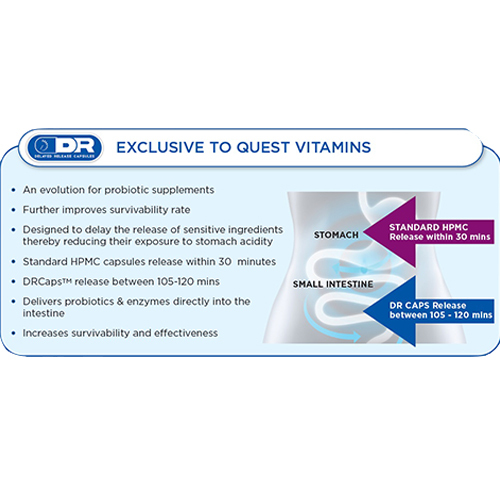 One to two capsules with meals containing milk or dairy produce. 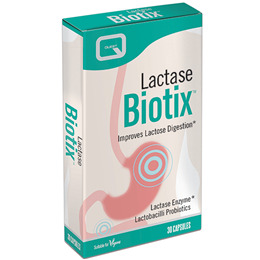 Below are reviews of Lactase Biotix - 30 Capsules by bodykind customers. If you have tried this product we'd love to hear what you think so please leave a review. This is an excellent product for anyone who is lactose intolerant as I am. It really works.